All of the metrics Westlake Technology Holdings shared about its 2018 performance headed in directions that would please just about any executive team or board of directors. And the company already is aiming for double-digit improvement this year. The company recently announced its portfolio grew 35 percent in 2018, finishing at an all-time high of $8.33 billion in assets under management. 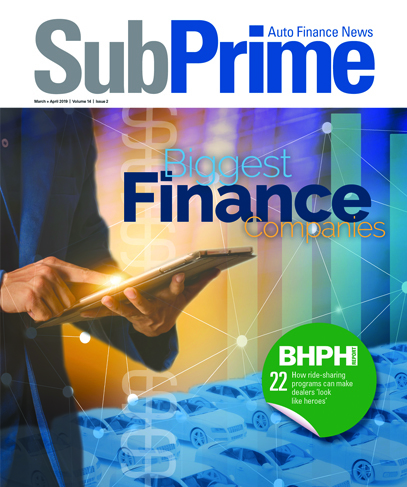 Executives highlighted that core automotive indirect financing originations and a reduction in net loss percentage contributed to this growth. Westlake said its core indirect financing operations delivered 40.5 percent growth over 2017, while 31-plus-day delinquency dropped by 9.0 percent. The company calculated these reduced delinquencies led in part to a 5.6-percent decline in net losses as a percent of total assets. Westlake mentioned its 2018 mix of originations continued to move toward a more full-spectrum portfolio, as near-prime and prime credit tiers (defined as contracts with FICO scores of 600 and higher) represented 40.5 percent of 2018 deals. Westlake Technology Holdings group president Ian Anderson said, “2018’s success was made possible by our outstanding employees, implementation of the latest technology and the commitment to achieving our goals. “For 2019 we project another strong year with increased growth and market share across all our companies,” Anderson added. — Western Funding ended 2018 with 76.6 percent year-over-year growth, a 12.5-percent reduction in 31-plus-day delinquencies and a 18.4-percent drop in net loss percentage. — Wilshire Consumer Credit decreased its 31-plus-day delinquency by 17.8 percent with a 13.2-percent drop in net loss percentage. — Credit Union Leasing of America (CULA) grew 29.5 percent this past year. — Westlake Flooring Services grew 33.0 percent year-over-year with a 69.5-percent reduction in 1-plus-day delinquency and 79.1-percent drop in net loss percentage. Furthermore, Westlake’s newest company, Westlake Portfolio Management (WPM), enjoyed strong first-year success with $350 million in portfolio servicing of active and inactive accounts. Westlake chief financial officer Paul Kerwin said, “2018 was a great year for us, because we increased market share while maintaining profitability. “We set aggressive goals, and our employees did an amazing job executing the plan,” Kerwin went on to say. For 2019, Westlake Technology Holdings said it is targeting 20-percent growth over 2018 and expansion of its direct lending platform on LoanCenter.com. Dealerships interested in learning more about Westlake Financial Services are invited to contact Westlake directly at (888) 893-7937 or online at www.westlakefinancial.com.